You’ve joined me for an incredible day! I’ve teamed up with the Silhouette Challenge blogger group to bring you 32 fantabulous holiday-themed projects you can make with your Silhouette cutting machine. I’m sharing my canvas art project with you here, and at the bottom of this post you’ll find links to all of the other projects. 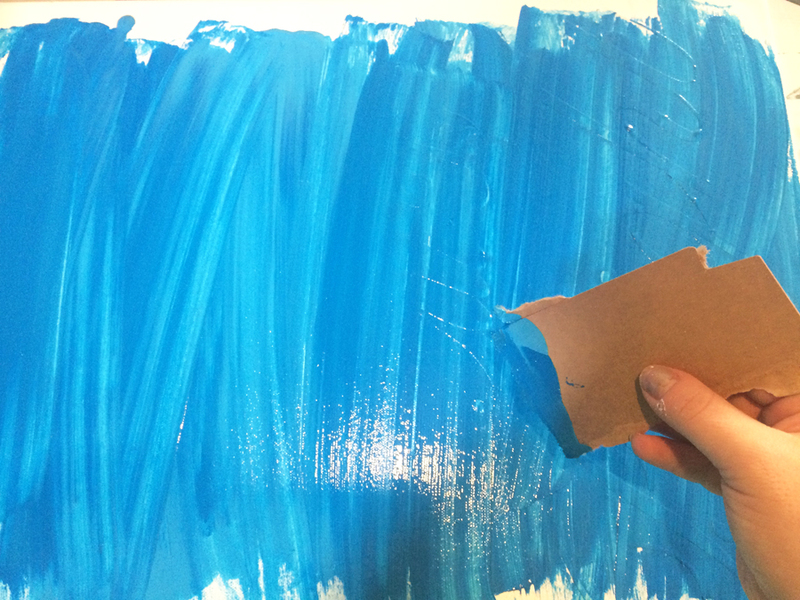 To get started, use a small roller brush to roll a coat of paint over the entire canvas. Use the color you want your words to be (I chose white). 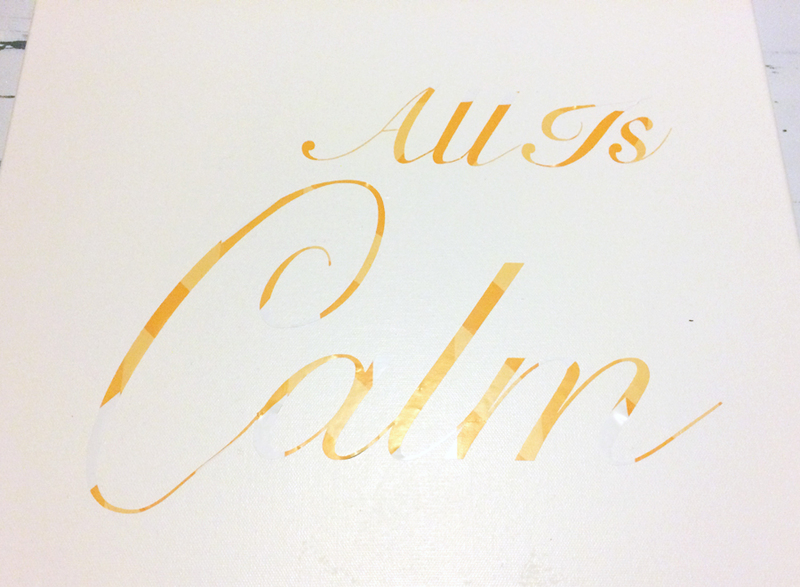 While the paint dries, design your lettering. 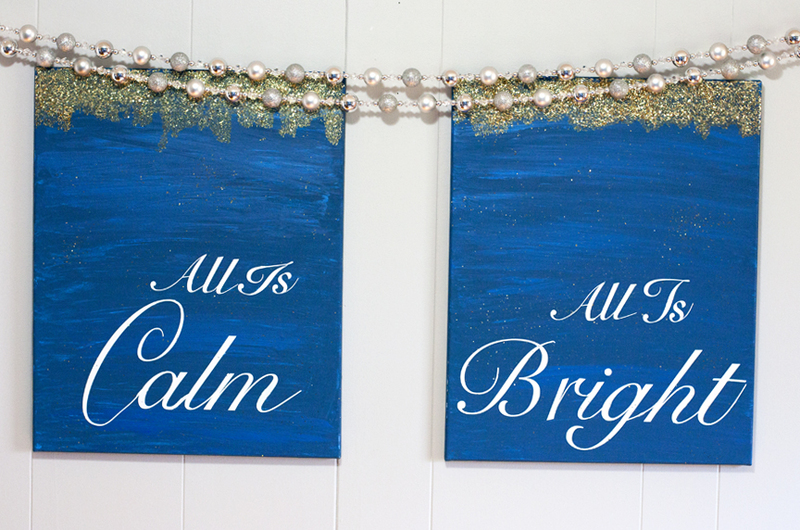 I decided on the phrase “All is calm, all is bright”, and thought it would work well to split the phrase with half on one canvas and half on the other. To get started, I designed my text in the Silhouette Studio design program. I set my document size to the dimensions of my canvas and played with the font layout until I got it just right. 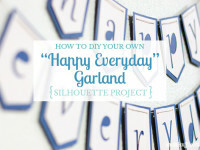 Use your Silhouette to cut out your lettering. You could use vinyl or go the cheaper route and use some cheap contact paper (that’s what I did for this one). You can feed a piece of your roll straight into your Silhouette, no mat necessary. Determine your blade setting and then start cutting. I used the ‘test cut’ function in the cut window to test a couple different blade settings until I found one that cut all the way through the sticky contact paper, but not through its backing. Once the words are cut out, you need to transfer them onto the canvas. 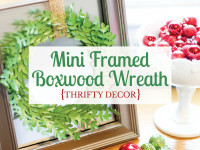 To do this, you can use transfer tape or clear contact paper will also work. Cut a piece of your transfer material to the size of your text and place the sticky side down on top of your lettering. Use your scraper tool to smooth everything out and make sure it is stuck down really well. Then, pull the transfer material up slowly. Your goal is to pull the contact paper letter with it, leaving the backing behind. It takes some patience, but just go slowly and use your hook tool to pull up the ends of letters if they get stuck. 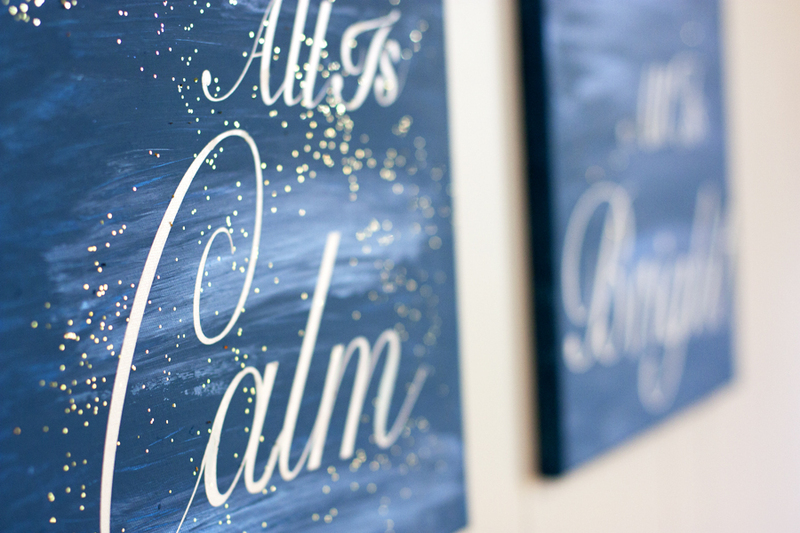 Once all of your words are stuck onto the transfer material, hold it over the canvas and make sure it’s aligned before sticking it down. Smooth everything down using your scraper tool, and then slowly pull up the transfer material while leaving the letters stuck to the canvas. This can take some patience, but it’s pretty easy to do. Tip: My cheapo contact paper wasn’t sticking to the canvas, so I sprayed a light layer of acrylic spray to make the lettering more sticky. Once your lettering is in place, roll another layer of your base coat paint on top of the letters. This seals their edges so there’s less chance of your top colors seeping underneath. While waiting for your paint to dry, get your paint ready. You will want several different shades of your color. 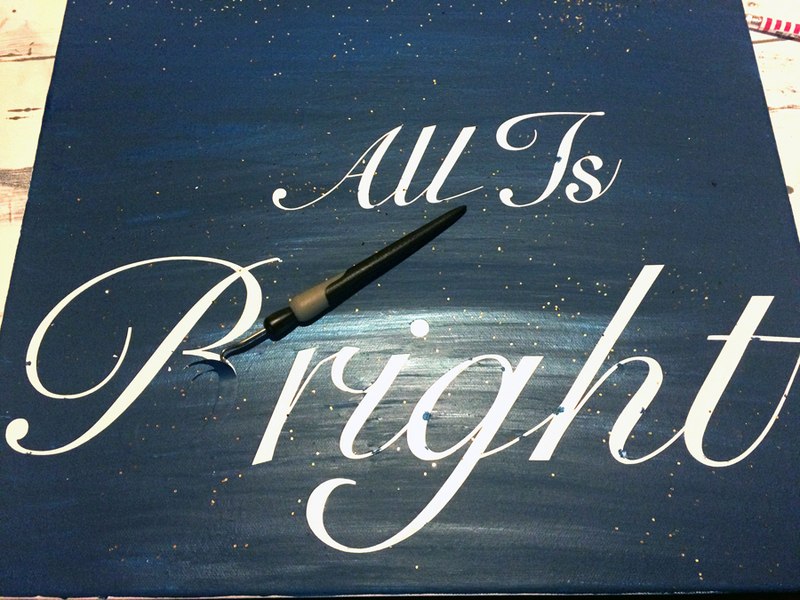 I envisioned a dark blue, starry sky feel for my canvas set. I decided to test out my painting plan on a piece of scrap paper. 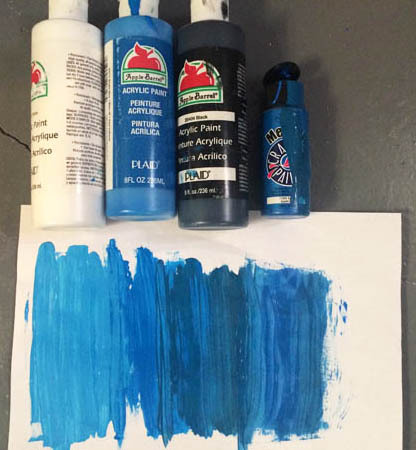 I had a bottle of blue acrylic paint on hand, and I mixed it with white and black to create three different shades of blue. 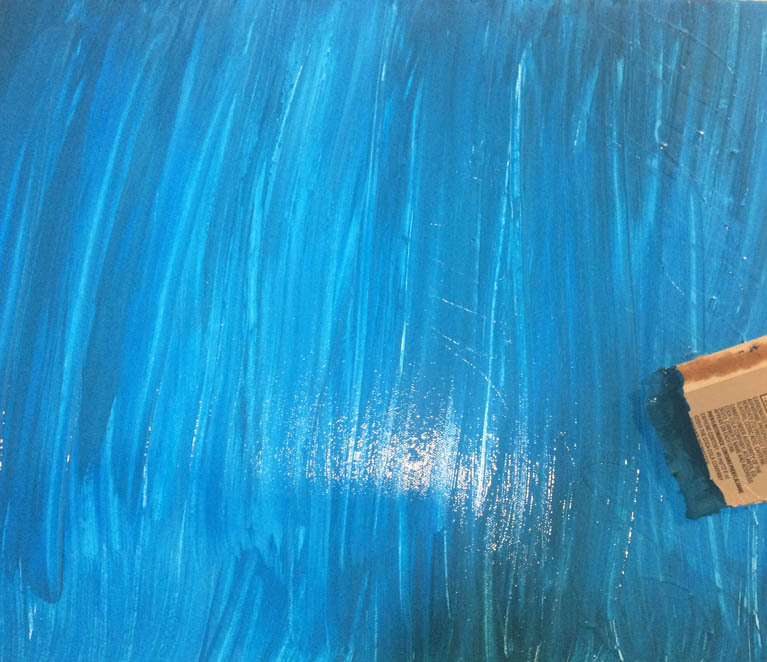 I also had a little bottle of metallic blue acrylic paint that I thought would add a little shimmer as a top layer. 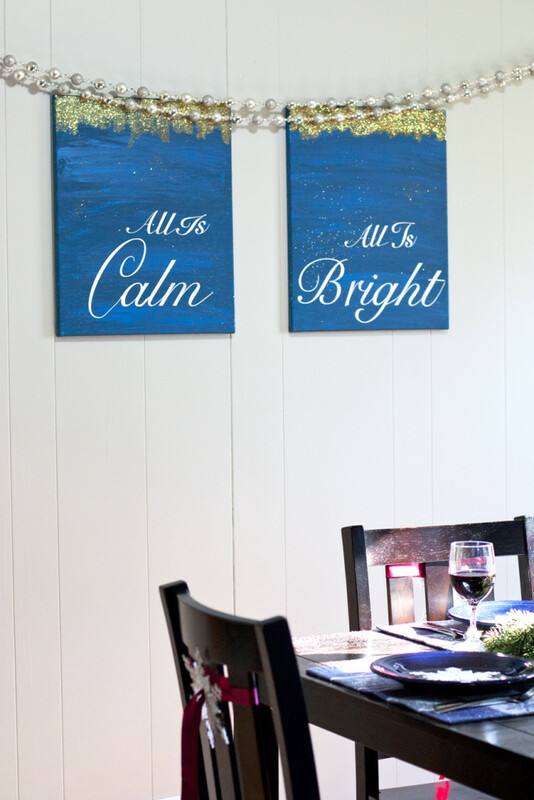 Use a scrap of cardboard to paint your canvas. It will make nice streaks and blend your colors slightly. Add a layer of your lightest color first. The best part of this project is that the painting doesn’t have to be perfect. While the first layer is still wet, layer your darker colors on top. Add random streaks of different colors until you like the way it looks. At this point, leave your canvas home until they are about 75% dry. If you’d like, add some light streaks of another paint on top of your nearly dry paint. I added my metallic paint at this stage. 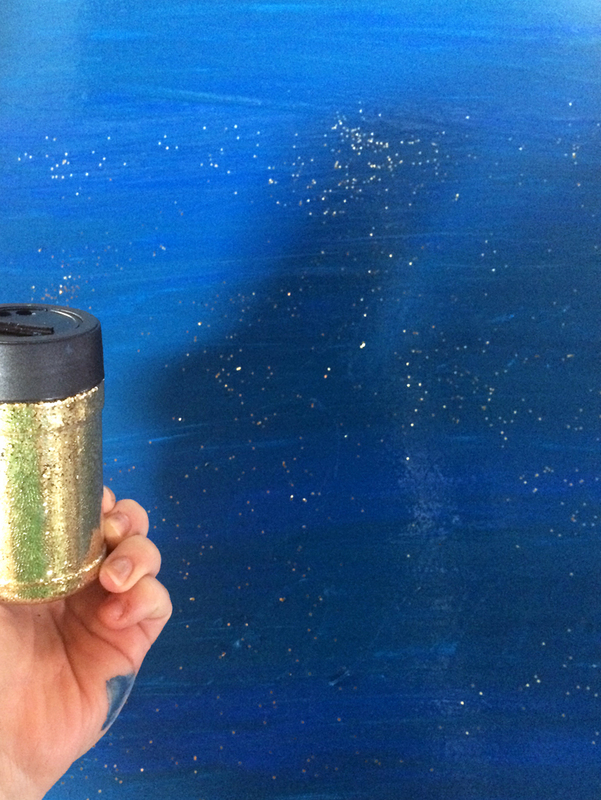 After your last layer of paint is complete, sprinkle a light dusting of glitter on the wet paint. Now it’s time to let these masterpieces dry completely. I left mine alone overnight. This is the worst part of the project, because I so badly wanted to pull up my lettering and see my finished project. Once they are dry, use your hook tool to slowly peel up the contact paper lettering. This step is weirdly satisfying! The letters should pull up fairly easily, leaving a crisp edge. There were a couple spots where my contact paper wasn’t stuck down well enough and a bit of blue paint seeped underneath. I touched those spots up with a very small paint brush and white paint. Do any touch ups you need. After stepping back to admire these beauties, I decided adding a little more glitter wouldn’t hurt 😉 If you want to add more shimmer, dip a paint brush in Elmer’s glue and paint it on the area’s you want glitterized. Then dump your glitter on top of the glue and pat it down with your fingers. 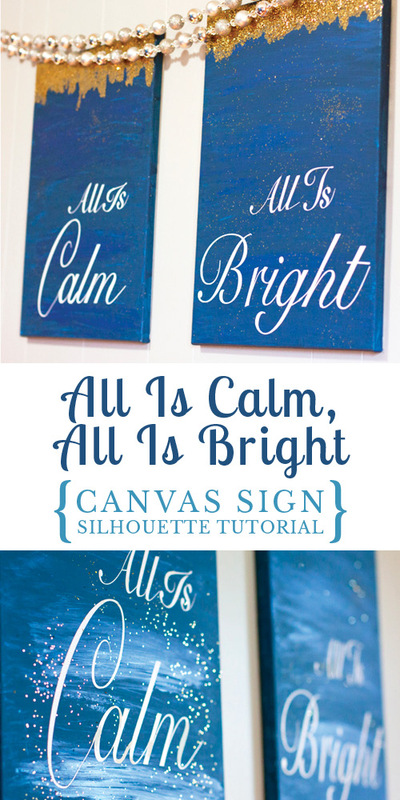 Once the glue is dry, brush off the excess glitter and your canvas art is complete! I was careful not to show you this wall during the holiday tour of my dining room last week, because I really wanted to save it as a surprise to show you today! My Silhouette Challenge friends and I are all sharing projects on our blogs today, so peruse the projects below for a wealth of holiday-themed Silhouette inspiration! 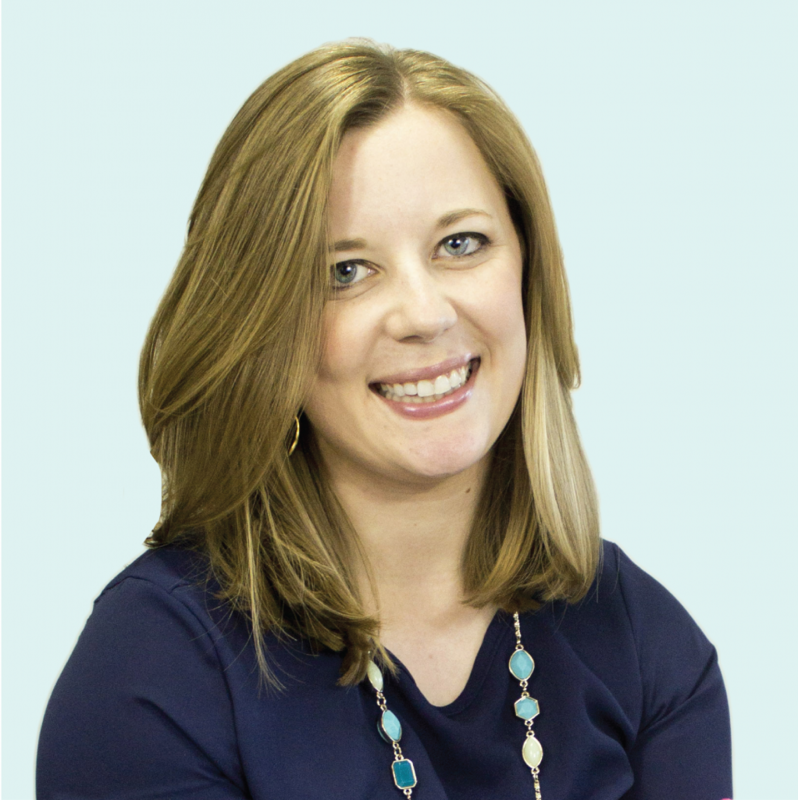 Silhouette Giveaway – Sorry, this giveaway has ended. WOW…. 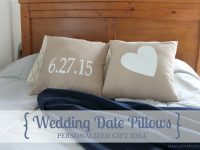 these are fantastic art decors! That glitter give them sparkle! I love glitter decor. Fab! What a gorgeous project. Love your paint finish – it’s perfect for the sentiment. Thank you, I am loving them as well. Thanks for stopping by!